Carrie interviews Olympian Kate Grace! They chat about competing in the Olympic Games in Rio, traveling Europe as an elite runner and the supportive role of Kate’s family. Recorded February 28, 2017 Photo courtesy of PhotoRun.net. Kate attended Yale University, where she was an All American and shattered multiple school records. She turned pro after graduation, sponsored by Oiselle and training with the New Jersey-New York Track Club. Kate competed in the 2012 U.S. Olympic Trials in the 800m and 1500m. 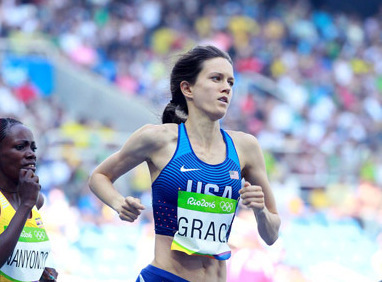 In 2013, she won the USA 1 Mile Road Championships, her first national title. She won the 800m final at the 2016 U.S. Olympic Trails and competed in the Olympic Games in Rio. In 2017, she ran the 4th fastest American indoor mile (4:22:93). Kate currently trains with the NorCal Distance project and is sponsored by Nike.